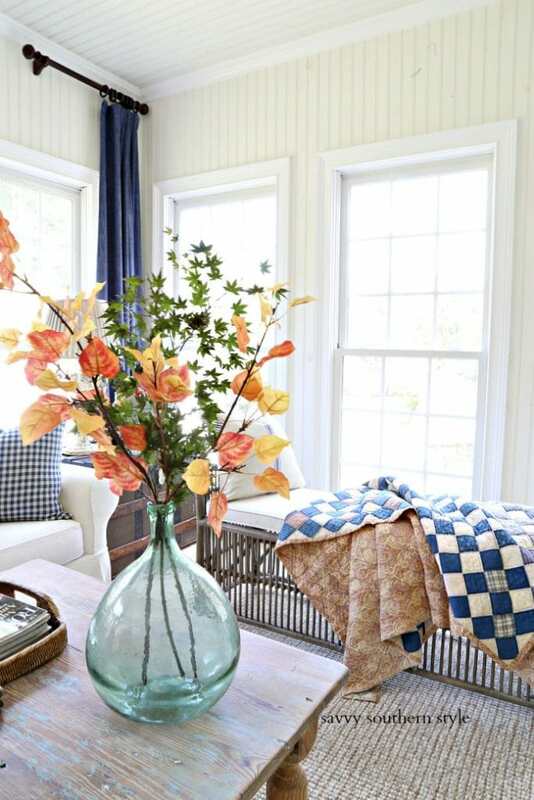 Coastal fall home tour designed with a light hand on autumn at our beach home. In our part time home we decided early on that we just didn’t want to be bogged down with stuff. It’s a relaxing getaway place for us and we just don’t want to spend a lot of time or effort keeping things clean and would rather be out on the beach! Since I do love to decorate seasonally for ALL seasons I make it work with just a small smattering of key elements and design around color. Today I’m joining with some talented blog friends in the Autumn’s In The Air tour hosted by Sheila of Maison de Cinq, and if you’re coming over from my friend Kim’s of Sand & Sisal then welcome! This year I focused on adding navy blue and when I think back to being here last year at this time I’m giving thanks. We were up at the beach vacationing when Hurricane Irma struck and although prepared, it wasn’t fun. We didn’t have a lot of damage here, but did have more at our Miami home. 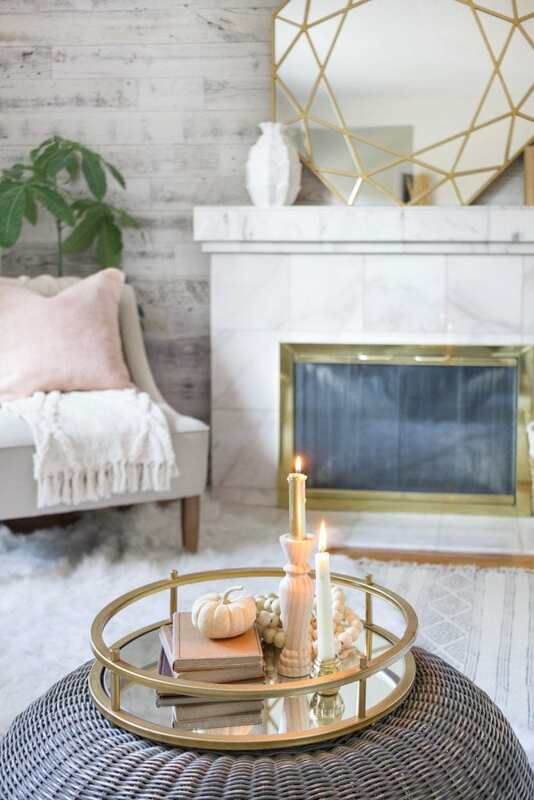 You can read the EASY COASTAL FALL HOME TOUR from last year and see how sparsely I decorated, using finds from the aftermath of the storm. 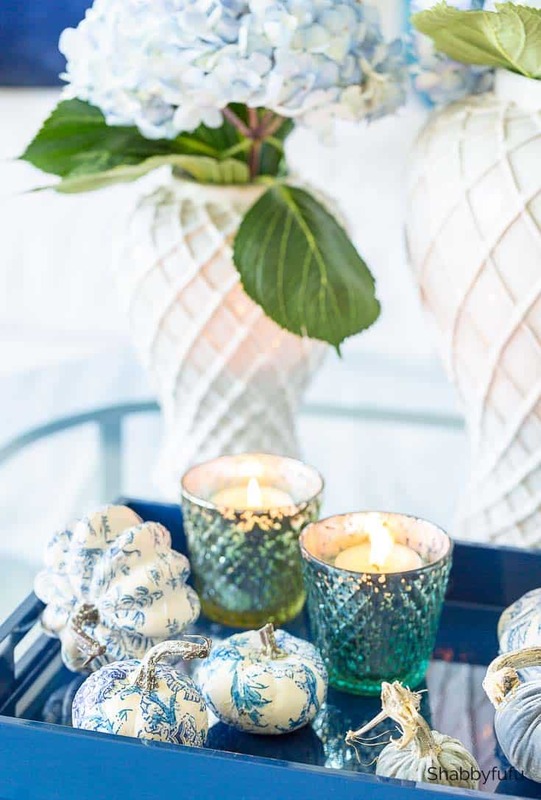 This year was all about navy blue at the beach and totally inspired by my CHINOISERIE PUMPKIN DIY. I brought a batch up to our beach home because they are easy to store. 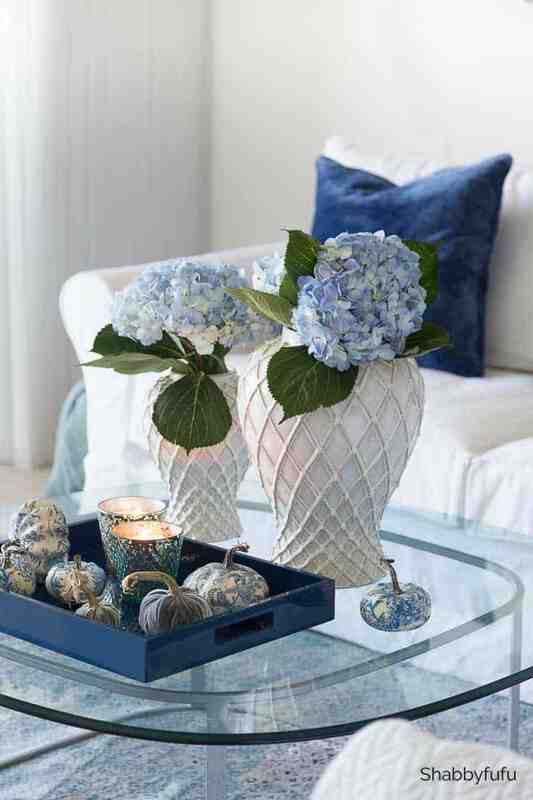 In the living room on the glass coffee table with a blue lacquer tray with some candles burning they are inviting and almost nautical. 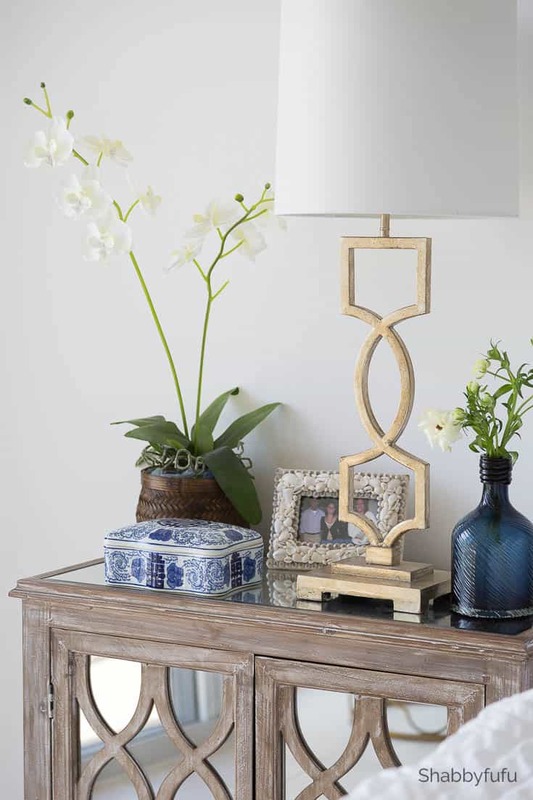 All of the furniture is neutral and that sure makes it easy to accessorize and add subtle color fixes. 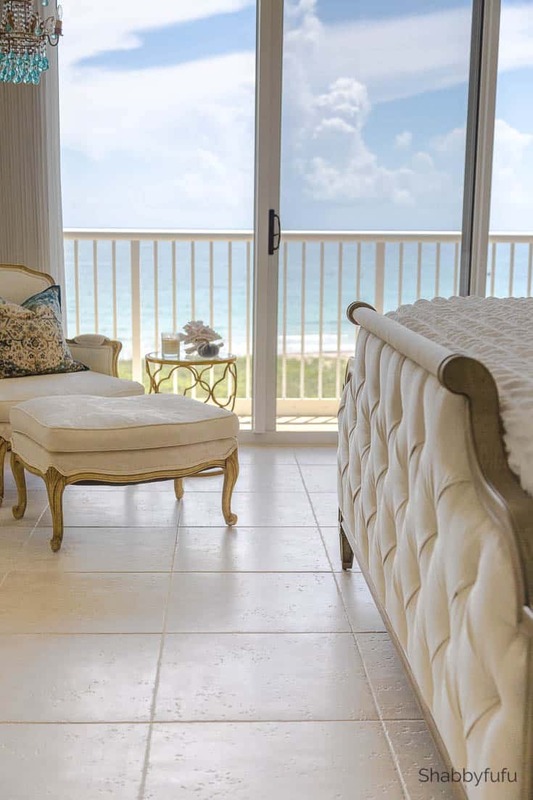 With the beach right outside we make the view the focus of attention and that doesn’t change for a coastal fall home tour. Some cozy velvet pillows add just the right touch in the master bedroom. Layer up with texture and reflect the color outside and you can never go wrong. I’ve mixed an antique French chair with a new gold gilded table with a simple dusty grey-blue velvet pumpkin, warm candle and beach coral. More blue, gold and Chinoiserie on one of the pair of nightstands. 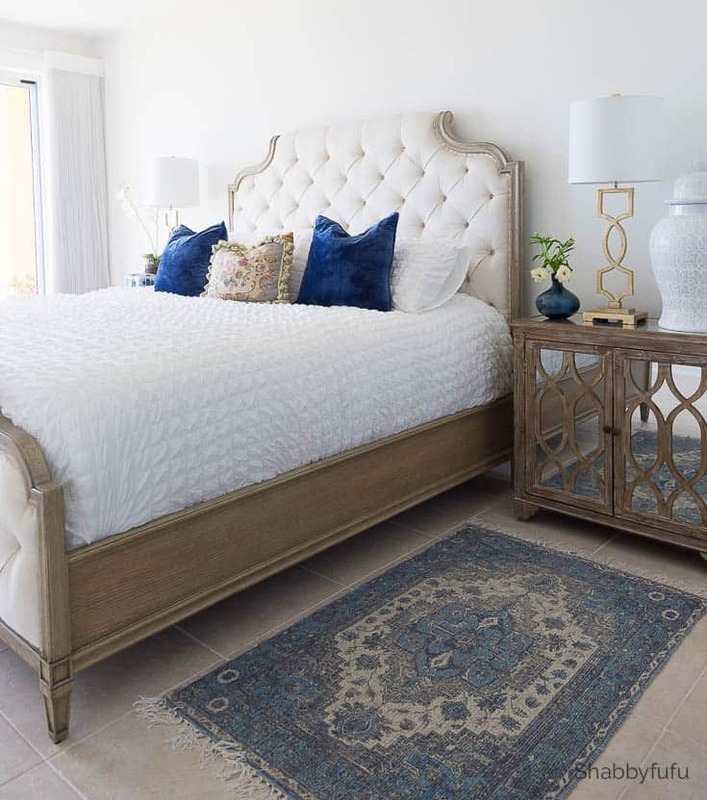 I opt for plenty of furniture pieces that give much needed storage in our beach home. 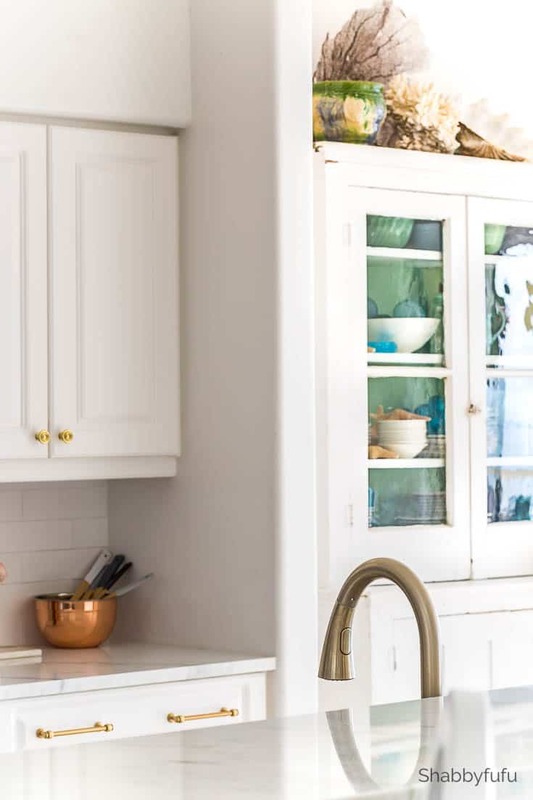 This coastal fall home tour designed came together in literally minutes of my time. 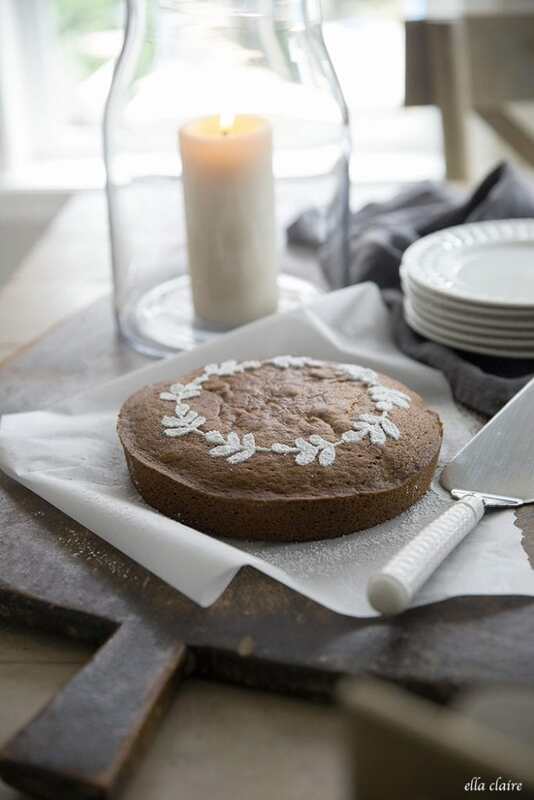 With an open concept even bright white can feel autumnal when accented with a rich deep color such as navy blue. More of the velvet and silk pumpkins in my collection and they are so elegant against the rustic tones of wood and bark. Yes, I have a huge collection and with fall being my favorite season they are mingled in. 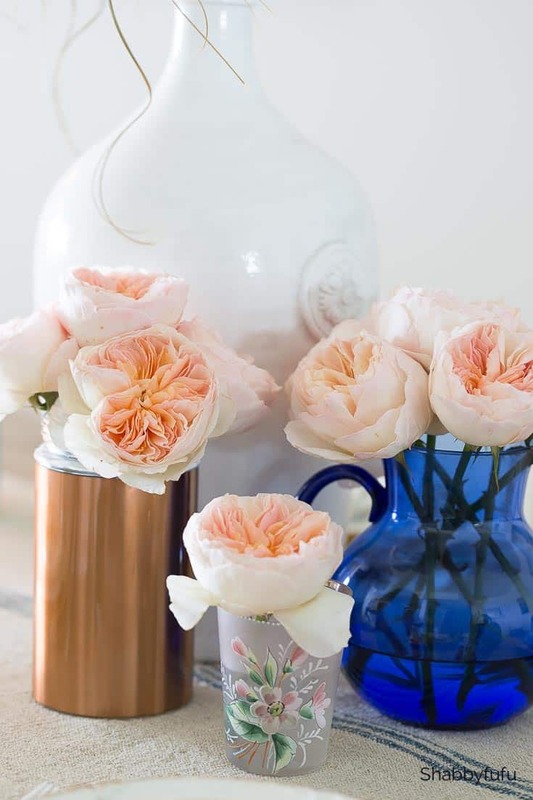 Copper, navy blue and an infusion of blush garden roses from my florist set on the table on another fall evening. You don’t need to go orange or go home for fall! I’ll share more of this table setting with plenty of ideas in an upcoming post. 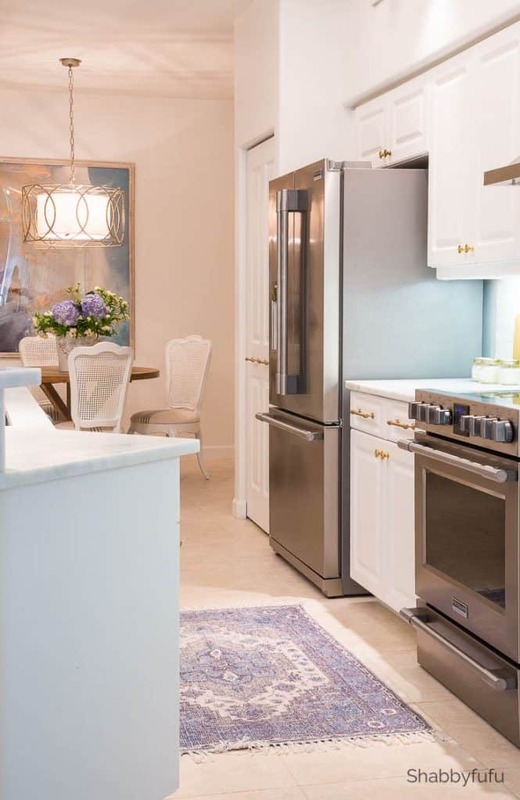 Moving into a glimpse of the kitchen that we recently renovated. You can see more storage in the vintage stepback cabinet that is vital to my seasonal decor and entertaining needs. I hope that you enjoyed my coastal fall home tour designed and that you leave a comment or email me with any questions. Head on over to see the rest of the tour from my next friend in today’s line-up Annie of Zevy Joy. Subscribe For All The Latest And Free Printables! Please pin for your inspiration below! 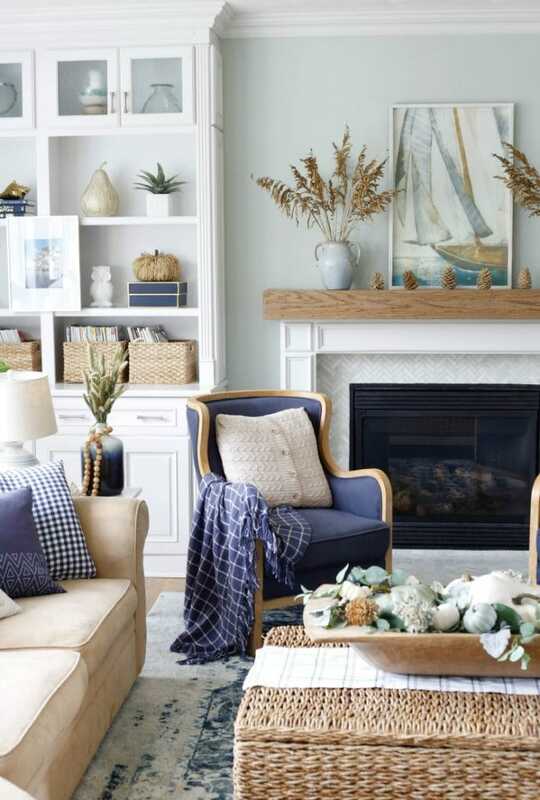 The perfect additions for fall in your beautiful coastal home. 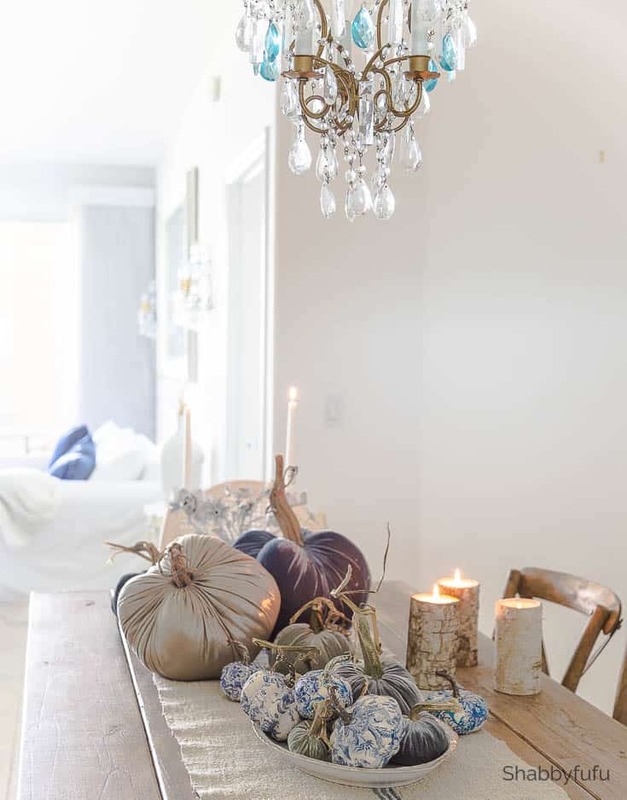 I love how you, Kim and I used blue in our fall decor. 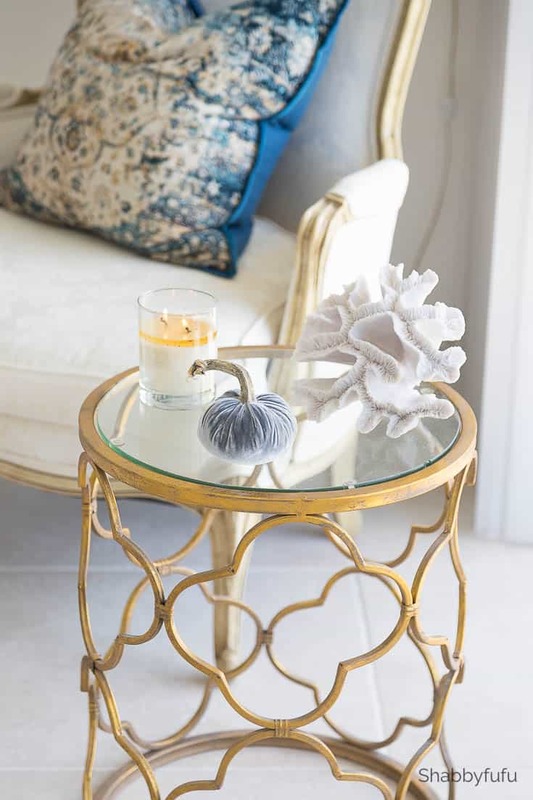 Janet, you did Florida coastal fall decor perfectly! I can see we were on the same wavelength this season! Just gorgeous! Janet I absolutely love the blue you used in your home! It just works perfectly here, and yet still feels like “fall”! And those chinoiserie pumpkins are SO cute! Love them so much! Janet, I really love the way you’re using blues this year and those chinoiserie pumpkins are so awesome!! Well done my friend!